With the Fitbit Ionic and Apple Watch Series 3 now available and battling it out, you've got two feature-packed smartwatches both worthy of a place on your wrist – but there can be only one winner. Both want to be your running partner, your fitness coach, your Mr Motivator, and your go-to swim tracker. The Apple Watch Series 2 could already track swimming, but with watchOS 4, that gets a little better. As for Fitbit, the Flex 2 was until now the only wearable in its lineup that could be safely taken in the pool, but now the Ionic joins the party with its gorgeous big display so you can not only log those swim sessions, but monitor them in real-time. But how does Fitbit's new smartwatch compare to Apple's? Which nails the accuracy? Which goes deepest on data? We've been swimming with both for a few weeks now. So there are two things you need to do before getting in the pool. You need to make sure you've got a tight, secure fit, which may sound obvious, but you don't want your tracker falling off because it can't handle your more intense freestyle strokes. Thankfully I've had no problem with either the Series 3 or the Ionic; both have stayed on throughout. I've been wearing the Ionic's perforated blue strap because I like the look, but the regular in-the-box strap gives you just as a good a lock. So the Ionic isn't going anywhere, and it's comfortable to wear in the pool. The Series 3 stays just as snug and secure, despite the sport strap appearing less forgiving. I will add that I've been using Apple's official bands, and some of the unofficial ones I've tried have been a little easier to prise open, so watch that. The second thing you need to do is calibrate for the pool length. Both the Ionic and Watch make this easy by letting you do it on the device itself, so you don't have to worry about going back for your smartphone, but you'll want to make sure you know how long the pool is before starting a workout, as this will help with both wearables' accuracy. It's also worth noting the experience of using both underwater. Chances are you'll be interacting with your wearable somehow once it's already wet, and as we know all too well, water and screens can be a frustrating combination. Both devices have more tactile alternatives to help here. The Ionic has buttons for navigating menus and starting/stopping a workout, as well as checking your real-time stats in the water. The Apple Watch has both a button and a crown, the latter of which is especially handy should you need to adjust the pool length when you're already in. Finally, while it has no bearing on the swim tracking, if you're using a Series 3 with LTE, you have the additional benefit of still being reachable by phone or messages while in the pool, along with other notifications. So this is what really matters right? Just how accurate are these two trackers at logging those lengths? In testing, both have come out pretty well. Neither have gone AWOL, although on the longest swim I logged there was more of a discrepancy between the readouts. As you can see above, on one swim, which was 28 lengths, the Ionic came in two lengths short and the Apple Watch came in two too many. I was checking stats between lengths too, and noticed both lost their way a little as I started switching up strokes. But as I say, this was the most extreme example. Other times, it was a case of one device over- or undercounting by one. For example, in the below case the Ionic counted one too many lengths, but in another, the Apple Watch was overgenerous. In those cases though, they tended to still both agree on the total distance, and both get it correct, even if one had an extra length. So for the most part, both devices have performed well, and as I say, even if it gets the number of lengths off, both have still usually finished up with the correct distance – and that's what really matters. However, over longer distances, and when you're changing up strokes, you can expect to get a few errors. And speaking of strokes, that's one thing the Apple Watch can track that the Ionic can't. At the end of your workout you'll be able to see a breakdown of your sets and the strokes, which the Watch auto-detects. Overall it's impressed me with how accurate it's got this. It's not perfect, and chances are if you're doing specialised drills with different movements then it's probably not going to nail it every time, but most of the time it's been able to tell the difference between freestyle, breast stroke and back crawl. 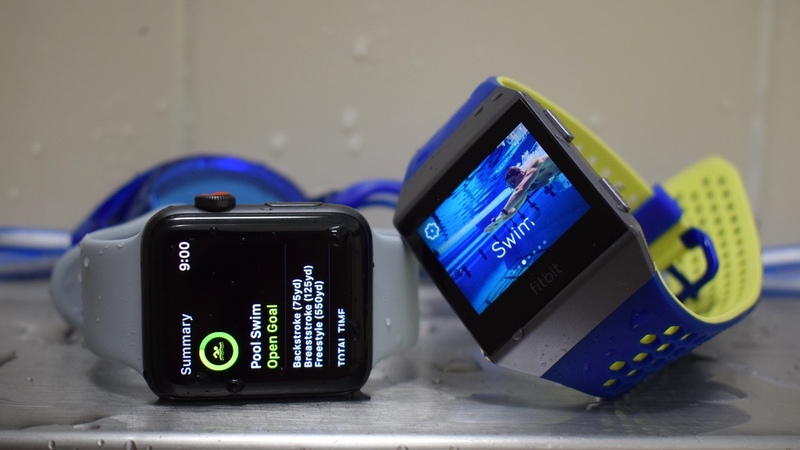 You might also notice that the Apple Watch tracks your heart rate in the pool while the Ionic doesn't. That's not really an added feature; like screens, water and optical sensors don't play well together either. Like mine, chances are your graph will be very patchy anyway. So you might as well ignore. I've touched on this a bit already, but there's also a difference in how much data you can pour over after your workout. With the Apple Watch, things have improved with watchOS 4, which now lets you see info on your pace for each set and distance for each stroke type. This gives more of a drill-down than was previously available and more closely aligns the Apple Watch with the more serious swimming watches out there. There are also a few third party Apple Watch swimming apps that can pull through that data to gain greater insights. Sadly Fitbit is still lacking in this department. You'll get your overall pace, distance and lap count, along with how your workout impacted on your day's overall activity, but that's about it. You've not got any graphs to dig into, nor a breakdown of stroke type. There are no swimming apps to use as an alternative, though that may well change once developers have had time to build them. That may be enough for some of you, especially if you're more concerned with how many calories you've burned than nailing those drills, but for those who crave better analysis of the data, the Apple Watch still wins. Both the Fitbit Ionic and the Apple Watch Series 3 are good swimming companions, and now that Fitbit's best swim tracker has a screen, you're able to see your progress on both in real time – which we really like. There are likely to be some discrepancies in the data, especially if you're swimming over longer distances, but the biggest distinction is in the post-workout data: the Apple Watch still does this better, and with watchOS 4 it goes deeper. If you're happy just having a device that keeps a log of those swims and makes sure you know how much they're counting to your overall activity, the Ionic does a great job. For those who want something that goes a bit further on analysing those sets, the Apple Watch is still a better choice.